Delete or rename AMDlogo.bik, Capcom.bik, and UE3_logo.bik. Scaling issues with loading screen hints. 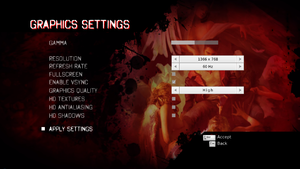 "HD AA" in the options menu, resulting 4x MSAA. See Anti-aliasing (AA) for SGSSAA. This tweak for Flawless Widescreen offers a slight FOV boost compared to the default setting. Open DMC5.lua with a text editor. Change it to fAdditionalFOV = Sender:GetScaledFloat(3). Change MaxAnisotropy=4 to MaxAnisotropy=16 for 16x Anisotropic Filtering, or other value to your preferences. 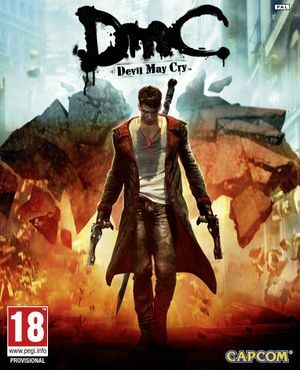 Open the DmC-Devil May Cry profile. Set Antialiasing Compatibility to 0x080000C1. Set Antialiasing Behavior Flags to None. Set Antialiasing Setting to Multisampling (2x, 4x, 8x). Set Antialiasing Transparency Supersampling to Sparse Grid Supersampling (2x, 4x, 8x). Small amount of acceleration that can't be disabled. X and Y axis sensitivity. Ability to invert x-axis as well. Some issues using DualShock 3 controller and Nostromo. Issues when rebinding DirectInput controllers. The game does not allow assigning Devil Trigger and Gun Special function to a single key press (when using keyboard) instead of executing button combo. Edit d3d9.ini in the same folder. See DmC Devil May Cry - 3D Vision fix. Problems saving change in refresh rate for some people, displaying 23 Hz instead of 60 Hz. Edit the lines ResWidth= and ResHeight= to match your resolution. Some controllers have a default setting which make using the right stick awful. The game will crash with MotionInJoy; Use XInput Wrapper instead. The controller will now show up as an Xbox 360 Controller in-game. When a Razer Nostromo is installed as a controller, the game crashes. 8 and later: right-click the Start corner (or press ⊞ Win+X), choose Device Manager. Vista and 7: open the Start menu, type devmgmt.msc and press ↵ Enter. Right-click Razer Nostromo, choose Disable, and click Yes to confirm. The Razer Nostromo keeps working perfectly with all the binds and will launch correctly. When using controller, game suddenly stops accepting analog input for few seconds. ↑ 1.0 1.1 File/folder structure within this directory reflects the path(s) listed for Windows and/or Steam game data (use Wine regedit to access Windows registry paths). Games with Steam Cloud support may store data in ~/.steam/steam/userdata/<user-id>/220440/ in addition to or instead of this directory. The app ID (220440) may differ in some cases. Treat backslashes as forward slashes. See the glossary page for details.